Unemployment. Something important has changed. Unemployment numbers came out today and they’re bad. Unemployment is up. Again. I was fossicking round in the data when I realised something important. There’s been a massive change. We are experiencing something unprecedented. 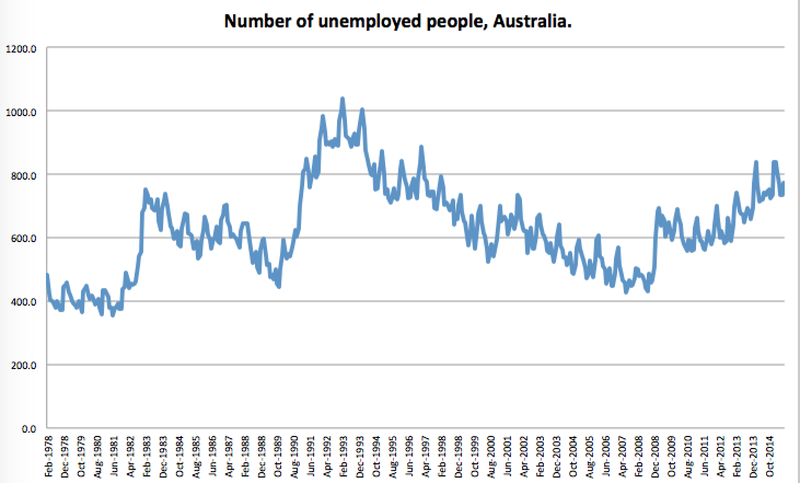 In the past, unemployment has surged up fast and fallen back down slowly. That’s the pattern. You’d get rising unemployment only in bad economic shocks. Now we’re getting slowly rising unemployment. Something has changed in the belly of the beast. And the effect you see above is not just an artefact of a higher population making the slope up look bigger on the graph. 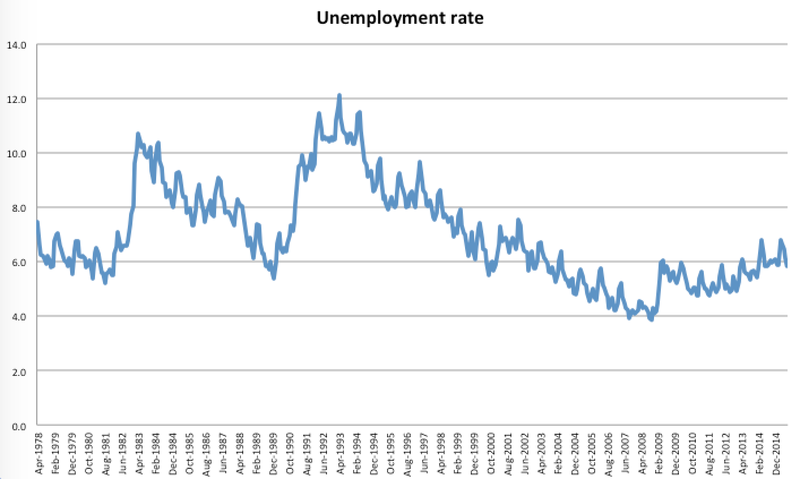 Here’s the unemployment rate graph for comparison. You’d be more knowledgeable than I on this issue, but could it be that companies are no longer hiring new staff and are slowly reducing existing staff levels in order to reduce costs? I certainly noticed this trend in both the legal and engineering industries, while the public service has notably been reducing staff in recent years as part of “efficiency dividends”. Yes, definitely they’re doing that. But there are always industries and firms shedding people. I’m unsure why it is the ranks of hiring industries is so thin. Prediction for unemployment in vic 2017/2018. ? Thomas, given you have greater access to data then many of us have my question to you is can you predict the rate or numbers of people being out of work when Ford closes next year followed by Holden some time after that and finally see Toyota closing up end of 2017. How many of these employees of so many who are disadvantages by age or by the simple fact they don’t have much other experience outside what they have been doing where they are at. I have the exact same access as everybody else! I maybe am a bit more familiar with the ABS website than a normal person, but I have no special privileges. As for predictions in 2017-18, I’d suggest the impact of the car industry shut down might be 0.1 or 0.2 per cent, but hopefully the unemployment rate overall improves before then. If I had to guess I’d say 6 per cent. Technological unemployment. The luddite fallacy is a fallacy. Welcome to the realities of a globalised workforce where technology enables organisations to overcome the tyranny of distance and the challenges of working in different timezones. Jobs are being process mapped and then being sent overseas. This way companies can get the same productivity and efficiencies at a lower cost. The jobs are still there, they are just being off-shored. Some of our university graduates will not get a job in Australia, because they have wasted their time preparing for a career in an industry where companies have little appetite for locally based workers. The Finance and Insurance sectors are experiencing this on a massive scale. If the average wage of a full time worker is $79,767 in Australia (http://www.news.com.au/finance/work/how-does-your-salary-stack-up-against-the-rest-of-australia/story-fnkgbb3b-1227044922950), how many people do you think that can fund in a developing country like India, China or the Philippines? With every change there are opportunities, unfortunately I don’t see schools and universities staying in touch with what companies are currently looking for. As such it will become harder for new entrants in the job market to reconcile the formal education they have received with the roles that are required in corporate environments of the future. It also means that existing workers need to learn and adapt or find their roles process mapped and sent off shore. Here is a link from the Institute For The Future (www.iftf.com) to a graphic on the types of future work skills that companies will be placing high value on if they are not already doing so by 2020. I’m not as despondent as you about our education system. I think the general education people get in schools should hopefully set them up to take advantage of a wide range of jobs. Trying to target education to an imagined future would raise alarm bells for me. Even at uni, a good well-rounded degree in business arts or law ought to give people some research, communication and problem solving nous, which is what most jobs will always require, I guess. You can’t be serious? You honestly can’t see how technology and outsourcing has begun disintermediating the job market here, in Europe and in the US? You can’t see how buying up bonds hence lowering interest rates, encouraging stock buybacks and discouraging investment in quality, long term jobs affects hires in the West? You can’t see the turnaround point just happens to be when the Fed started swallowing up everything is sight? Compare and contrast this with your piece about housing market affordability in news.com.au. You’re right. The system has changed and can’t be structurally ‘fixed’ again by altering the metric from average weekly earnings to average household earnings. That’s been the result of the housing boom; forcing a second income to service housing debt. Your simplistic rationalisation of house prices also only holds if you contend rates will continue to fall to zero and beyond and full employment will remain a feature of the economy. These assumptions are both inconsistent with our current position. Forget the vague ‘but new jobs will replace those lost’ garbage because they have in the past. This is a completely new era of second order exponential technological change resulting in the automation of everything, yet anaemic economic growth due to the slowly expanding number of workers/consumers who in turn won’t be able to afford the debt they already have. The signals are already there in the participation rate, explained away as more people retiring and living longer but when you delve deeper the only real job growth has been in part time/low wage over 55s who no longer can afford to live on pitiful fixed interest investments. Growth in jobs for those in the prime of their working life is negative. Asset price deflation -> collapse in taxation revenues -> increase in social security-> bigger deficits -> higher risk -> more expensive debt … and you can work out the rest. I am confused. You describe the structural motivators that lead to this environment but your counter is “better” education? You just have to ask yourself what is the cost of educating any individual in a population of a million and a population of a billion? Sometimes you cannot compete regardless of opportunities or how adaptive you are as an individual or locally. The value of labour is decreasing, capital increasing. You see it in the mature economies, this creates trends of consolidation. This greatly concerns me. You don’t have to go deeply into history to see what inequality does to social cohesion. I really believe that when robots take our jobs, there’ll be new jobs for people to do. That’s the complete economic history of the world so far and I am completely unconvinced that this time is different. We should educate everybody. You ask the cost of doing so. I’d be far more worried about the cost of not doing so. This is why I am a recluse. You have taken the means as the goal. I have nothing, good luck with your jobs. I have not taken the means as the goal. I disagree with you because I think what you miss is that what humans demand from society is infinitely elastic and when robot-made food and clothes and entertainment become infinitely abundant they will cease to have subjective value and we will want what is scarce and expensive. The economy will re-form around those things. Educated people will be better off in that scenario. “The economy will re-form”, “there’ll be new jobs for people to do.”, “We should educate everybody.” In reality these opportunities can be devastating to individuals. Reminds me of that story about the doctors having to constantly dive in an rescue people from the river, never going up stream to see where they are all falling in. Do an interview. Go to one of the big company layoffs and find some over 40s, with several children and a mortgage. I bet they will feel so much better once you explain they now have the opportunity to reinvent themselves. I would watch that. What you non-science economists fail to understand – and what doesn’t appear in any of your linear rate of growth models – is that technological change itself is an exponential function; the rate of change of the rate of change is increasing exponentially. The tools that make the tools improve, in so doing accelerating the impact. The most important reason when you’re only starting to see the impacts because the world is now software. Software defined hardware is not far behind either. This is no different from the past. The rate of change of progress itself has always been increasing, you just haven’t been able to see it because on your timeline of the history of economics, it’s always approximated a linear growth function. Go back further. 200 years. 5000 years. 100,000 years. 1 million years. You can see the timeline of technological change has been compressed. For the last 30 or so years and the last 15 in particular, economists and governments have artificially forced that straight line by a near exponential expansion of debt. The result has defied all Keynesian and Austrian models of what should happen. This time isn’t different, it’s just the continuation of the same trend. Pingback: 2015 edition: The future of work in 27 powerful charts - Management. Disrupted. - New management thinking for the future of work. I work in the automation field specialising in data analytics. I would say that from where I sit, automation does create more jobs, but it is very different to the type of workplace that existed before. I need highly skilled, highly trained people to look after hundreds of servers doing different things and billions of rows of data. They need to be smart enough to troubleshoot what the machines cannot. It is extremely difficult to hire these people in Australia but once you do, you don’t need any mediocre technologists anymore. I have worked on projects where we replaced entire teams (from 7 to 20 people?) of local staff that used to do a lot of the work that the systems are now integrated to do automatically, or the data is of the availability where the executive can now do the analysis themselves where it previously took 3 – 4 staff to get the data in order. I think the labour force if the future looks to be a divide of the highly skilled (whether it’s technical or soft skills), and the physical or people facing where machines are very difficult to replace like aged care, cleaners, hairdressers, nannies etc. Scary thought. I’m really pleased you posted this. Because I was just reading an excellent speech from the brightest mind at Australia’s central bank, about the way innovation requires a different type of person these days. She argues that is a barrier to their uptake. “Prior waves of innovation in general-purpose technologies, such as the Industrial Revolution, electricity and the previous computing revolution, all had a ‘democratising’ character, in the sense that the new technology could be operated by less-skilled workers than the technology it replaced. This wasn’t always benign, as the child factory workers who replaced artisan weavers during the Industrial Revolution could attest. But it did set these technologies up for widespread adoption. Seems like you, I, and she all agree that the future will involve a lot of person-to-person work while firms with incredibly high productivity make large profits (and possibly move into more and more industries). Previous Previous post: Five notoriously brilliant business models Netflix cobbled together into an undefeatable vortex of binge watching.